has won a special Civic Trust Award. The Centre was awarded the Michael Middleton Special Award. The announcement for the 2016 Civic Trust Awards, Pro Tem Awards and AABC Conservation Awards winners was made following the 57th annual Awards Ceremony, which took place on Friday 4th March 2016 at The Swan, Shakespeare’s Globe Theatre in London. 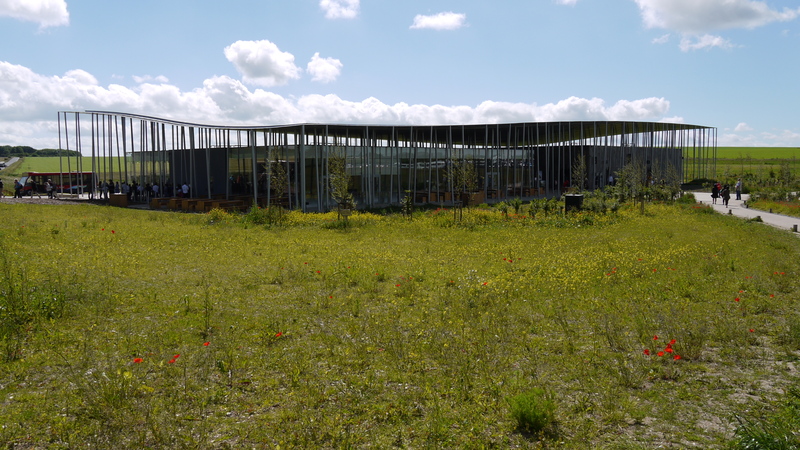 The Stonehenge Exhibition and Visitor Centre provides the long overdue interpretation and education facilities for the Stonehenge World Heritage Site. 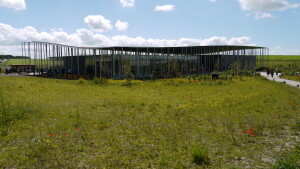 The undulating metal roof reflects the rolling landforms of Salisbury Plain and the visual effect of the sheet overhanging the blocks beneath, gives a transitory and temporal sense to the centre. The building is a light touch, embracing its landscape context. This approach ensures the solidity and timelessness of the stones is not compromised or visually diminished by the new structure, creating a meaning prelude and gateway to Stonehenge. 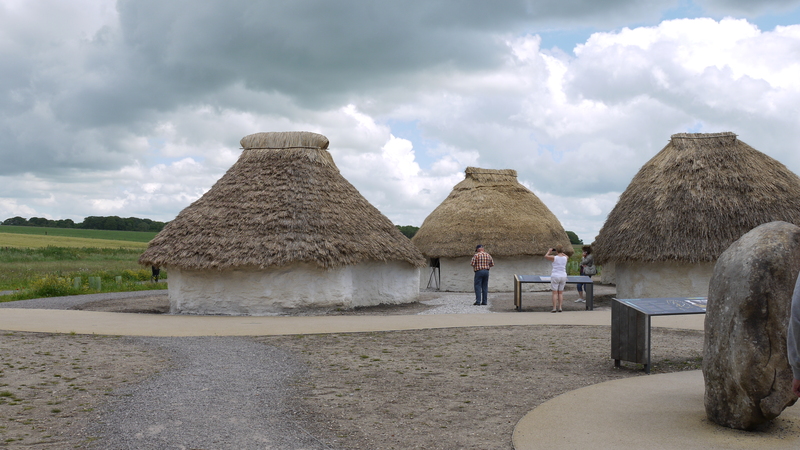 It is crucial to the relevance and significance of the experience of Stonehenge that the Visitor Centre presents an image and sets a mood which reinforces the same sense of solitude, dignity and timelessness of Stonehenge without in any way competing with it. 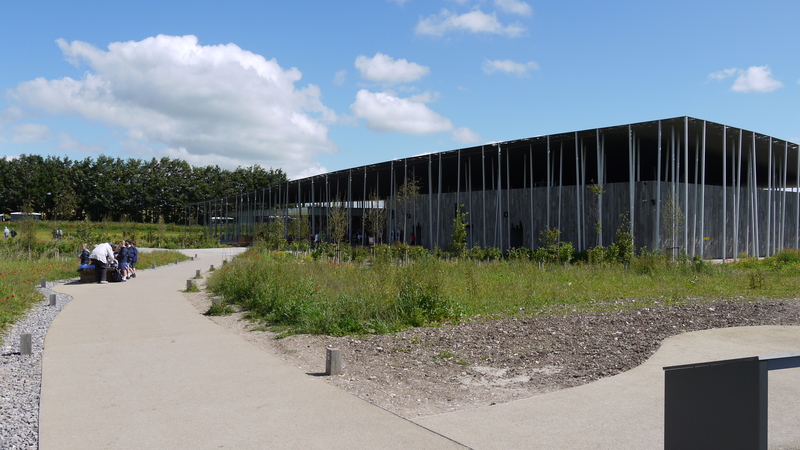 The new exhibition and visitor centre has the lightest possible touch upon the landscape. It is contained in a series of simple cubes, sheltered by a fine perforated canopy echoing the rolling landforms of the Salisbury Plain. The single level building, its volume diffused by the overhanging canopy, takes on an ephemeral quality; ensuring that the integrity and visual impact of the Stones – massive and timeless – is in no way compromised or diminished. The Stonehenge Environmental Improvements scheme has required extensive unparalleled consultation due to the international interest generated by the site. The Stakeholder list for planning included over 120 parties ranging from UNESCO, The UK Government, the National Trust, archaeologists and the local community. 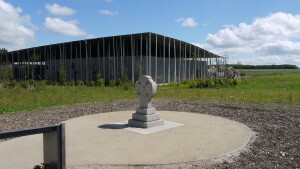 English Heritage also created a number of local events and forums to not only engage with the local community and interest groups throughout the design stages, but to also ensure the new Visitor and Exhibition Centre continues to encourage ongoing engagement with a wide range of users and the local community. 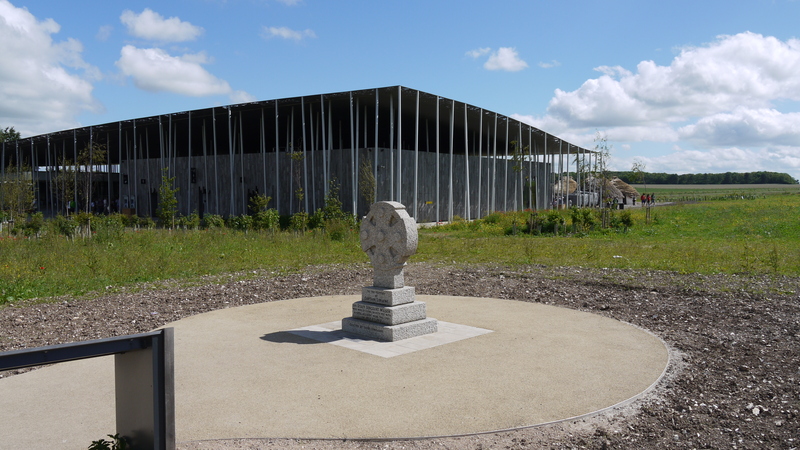 Full details on this and the other Civic Trust Awards can be found here.